Dividend stocks can be wonderful long-term investments. Our contributors have three that they think are ideal for novice investors. Money trees may not exist, but dividend stocks are a real-world source of steady income. Image source: Getty Images. If you're just getting started as an individual investor, congratulations! You've taken a big step toward financial independence. And since you're reading this article, you've put dividend stocks on your list. Great news: Dividend stocks can often be market-crushing long-term investments. The hard part? Investing in great companies that can continue paying that dividend and even raising it regularly, while still being able to invest in improving the business itself. With that in mind, three of our regular contributors offered up what they think are the best dividend stocks for beginning investors. The list includes Procter & Gamble (NYSE:PG) and PepsiCo (NASDAQ:PEP), which own some of the most recognized consumer-goods and food brands in the world, and MasterCard Inc. (NYSE:MA), another globally recognized brand, and a leader in electronic payments. Keep reading to learn why our contributors think these stocks are ideal dividend investments for beginners. Dan Caplinger (PepsiCo): One of the best ways for beginning investors to introduce themselves to dividend stocks is to focus on the companies behind the consumer products that they use every day. One great example is PepsiCo, which is best-known for its namesake cola. The beverage giant also makes Mountain Dew, Gatorade sports drinks, Tropicana juices, Lipton tea, and Aquafina water. Yet what many beginning investors don't realize is that PepsiCo is also the maker of Frito-Lay brand snacks, including Lay's potato chips and Doritos tortilla chips. Have you eaten a PepsiCo product this week? Image source: PepsiCo. 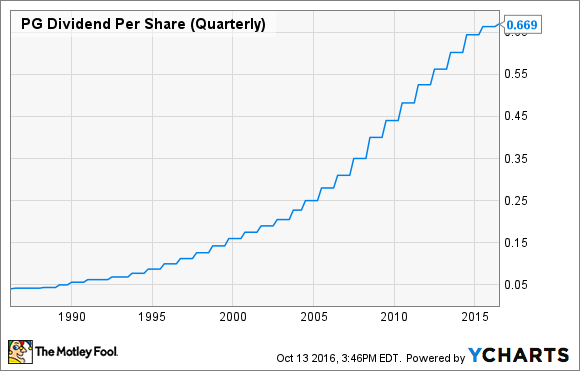 From a dividend perspective, PepsiCo has been generous with its shareholders. The stock currently sports a dividend yield of 2.8%, paying its shareholders $0.7525 every three months per share that they own. That yield is significantly above the stock market average, but what's even more impressive about PepsiCo's dividend is the fact that the company has given shareholders an increase in its quarterly payout every single year for 44 years running. The most recent increase came in June, adding 7% to the dividend. With such an attractive combination of opportunities to grow its core business and reward shareholders with future dividend increases, PepsiCo makes a great starting point for beginning investors looking for portfolio income. Neha Chamaria (Procter & Gamble): If you've just started investing, a great way to pick dividend stocks that can offer you good value for money is to look for companies with an easy-to-understand business, a defensive industry, a sustainable business model, and a track record of dividend increases. A dividend yield higher than that of S&P 500 should act as cherry on top. In those regards, Procter & Gamble is a perfect choice in every way. Chances are, you own one (or more) of these brands. Image source: Procter & Gamble. What I really admire about P&G is its consistently healthy conversion ratio. It's targeting 90% profit-to-FCF conversion and mid-single-digit growth in EPS for financial year 2017. P&G's ongoing restructuring, such as the divesting of less-profitable brands such as Duracell and Coty, should further boost its cash balances significantly, giving it leeway to raise its dividends in the years to come. 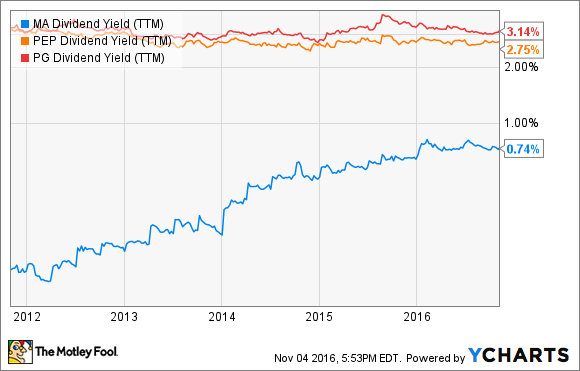 Long story short: This 3% dividend-yield stock could be a great addition to your dividend portfolio today. But don't get too caught up in the yield, particularly if you're just getting started investing. The thing that makes MasterCard such an excellent dividend stock to buy now and hold for years and years is the strong prospects to grow that dividend, as global electronic payments expand on the growth of the global middle class. Electronic payments are a relatively small share of global transactions today, despite how ubiquitous they are in the United States. But with the global middle class on track to expand by around 1 billion people in less than 20 years, a lot more people will be making transactions without handing over cash in the future. And there's no doubt MasterCard will play a very important role in that expansion, with its secure network and strong reputation with both merchants and consumers. And all that growth will support potentially enormous dividend growth over the next 20 years. Mobile payments is a key global driver for MasterCard. Image source: MasterCard. PepsiCo as an excellent example of how that could work out. In 2001, PepsiCo's quarterly dividend was a split-adjusted $0.145 per share, which yielded about 1.2% at the then-share price of around $49. Today PepsiCo's share price is above $105, and it pays a quarterly dividend of $0.752 per share, good for a yield of 2.8% if you bought shares today. But for investors who bought shares back in 2001 for $49? They're collecting an effective 6.1% yield on their original investment, in a stock that was paying only 1.2% at the time. So if you're investing for the long term, a dividend growth stock like MasterCard could generate big income years from now.